Private Tours in Italy by Vatican Tours Inc. The Last Supper is 15th century mural painting in Milan created by Leonardo da Vinci for his patron Duke Ludovico Sforza. It represents the scene of the last supper from the final days of Jesus narrated in the Gospel of John 13:21, when Jesus announces that one of his Twelve Apostles would betray him. 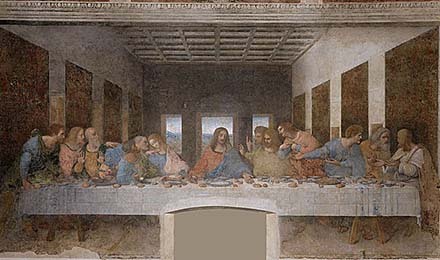 The Last Supper measures 460 x 880 centimeters (15 feet x 29 ft) and covers the back wall of the dining hall at Santa Maria delle Grazie in Milan. Leonardo started to paint The Last Supper in 1495 and completed it in 1498, as witnesse by Luca Pacioli who, on February 4th 1498 writes of it as a finished work. Tour cost to be charged to your card. Booking for more then 10 guests?